Now that I have finished my 2015 lap of the Summits I can get access to I will not be activating until after the new year. Then if grape harvest kicks off I hope to be busy during February March on that job but if we get a thunder storm to dampen down the fire danger I might get a couple summits done during the later part of summer. I usually activate Mount Gawler when the Tour Down Under bike race is in the Adelaide Hills that way I can do an activation then go watch the bike race go by somewhere in the Hills. Mount Gawler is a safe summit to activate and I never bother to enter the owners property the trig is just a short way over his fence so I set up by the gate. 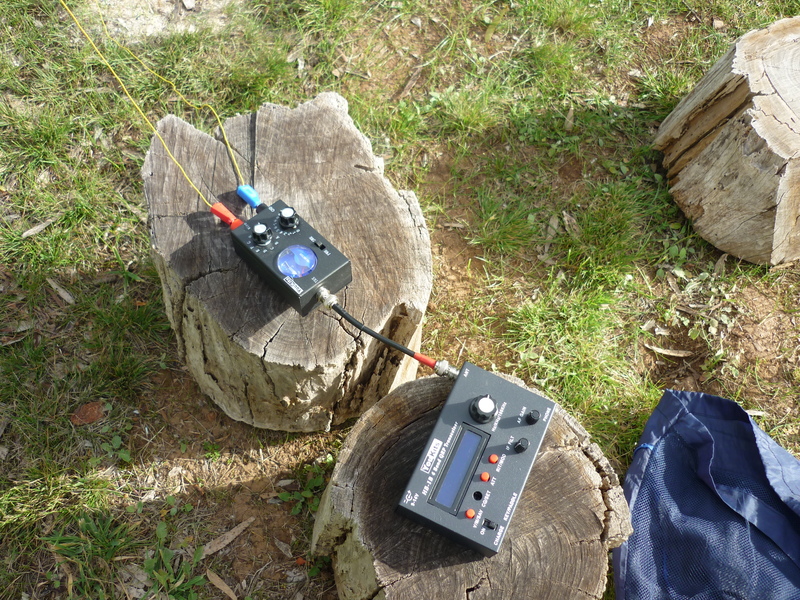 With Japan being on SOTA now I am always trying to work them on 15/17 m and if I get a cool morning I set up out side in the yard to try to work them proving the possibility for a S2S one day to Japan. I have made several QRP qso”s to Japan before so no reason why it can’t happen again . I was thinking of trying a vertical half wave wire when I get the chance to set it up and test it but the weather has been so hot on most weekends its still a guna do project. The last cooler weekend Halima helped me fix my dipoles for the home station that needed some fixing as trees have grown up around them and they needed lifting higher to avoid rubbing on my antenna ropes etc ,this was the main reason they fell down. 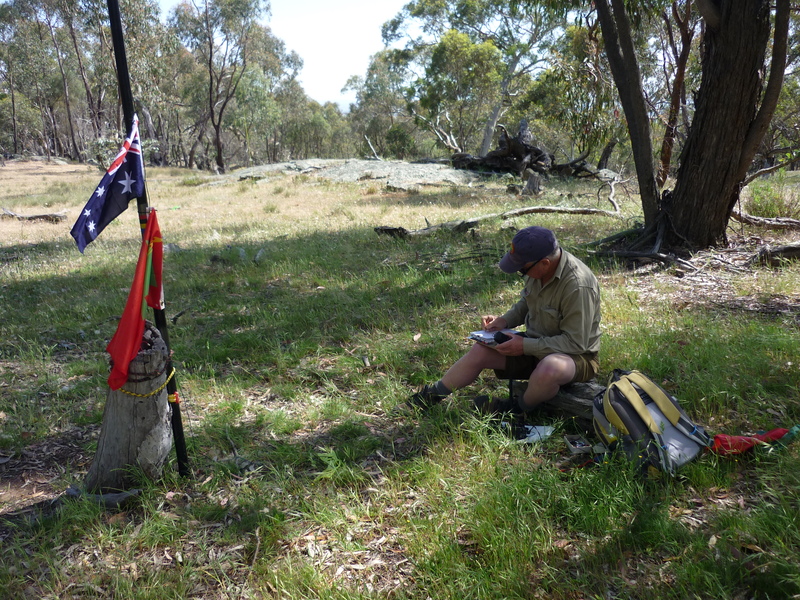 My last SOTA for 2015 at Wagga Wagga. Keen to use my new HB1B Mark 3 this year for cw activations. Been playing with those end fed antennas again and I got a 53 foot EFRW on test at the moment with 6 feet of counterpoise. The KX3 atu tunes it easily on 40 20 15 m with just a binding post and banana pugs to connect it to the rig. Using the FT857 I have the MFJ 904 in use with a list of inductance and capacitance setting jotted down in my log for quicker selection when changing bands. The HB1B has the MT 1 end fed wire tuner to use with the qrp rigs and it has a nice selection of inductance and tunes it easily also on the above bands. So what I mostly need now is some better propagation to give things a work out. I have spent a few cooler evenings down the hill at the test site but the higher bands seem to die off as the sun goes down with not even beacons that readable on 20 or 15 so its a bit hard to round up a qso. I did get a shock on one evening just as I was about to pack up and escape the mozzies flying sorties I put out cq on 40m and got an answer from KI8R much to my surprise. I was running the 857 at 30 watts and USA was directly behind me so the signal must have been going out the back side of the antenna . Being 53 feet long I have it set up to slope down with 10.6 metres on the longer side and the remanding 6 odd metres past the top of the squid pole and lots of cord going out to continue the inverted V shape of the antenna. Not sure what the radiation pattern would actually be or where most of the signal goes , probably lost in the tuner at ground level. ← 3 Years of SOTA in VK5.